Locations of Friday's burglary (red) and break-ins listed in a recent CPD community alert (blue). 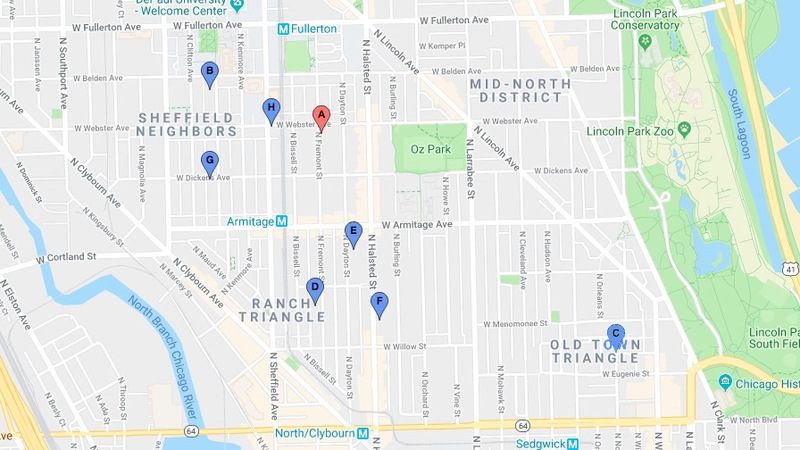 Just hours after North Side detectives issued a community alert about a series of home burglaries in the Lincoln Park neighborhood, alert witnesses may have seen the criminals in action. Just before 1 p.m. on Friday, officers responded to a burglary in progress in the 2100 block of North Fremont, right in the middle of the area where investigators said earlier that a break-in crew was operating. The burglary on Fremont failed on Friday, but police may now have descriptions of the offenders: A man and a woman who are using a black Jeep with a license plate that begins with “Z742.” The woman is white, 5’5” tall, with a light blue or gray thigh-length winter jacket, black leggings or gym pants, and black snow boots. The man is black and 5’7” tall with shoulder-length dreadlocks, a black quilted winter coat, and dark pants. While police have not publicly linked Friday’s burglary attempt with the previously-announced crime pattern, the incident has many of the same traits as the pattern, including geographic area and time of day. Detectives suggested that residents in the area keep their doors and windows secure, track serial numbers of valuable pieces of property, and ensure that video surveillance systems are functioning correctly. Anyone with information about the burglaries may contact Area North detectives at 312-747-8380.